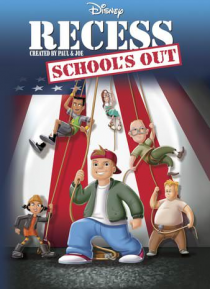 The Third Street Elementary School kids are teaming up to save summer vacation for kids all over the world in Disney's RECESS: SCHOOL'S OUT! The school year is finally ending, and T.J. Detweiler is looking forward to summer. But boredom quickly sets in when his friends leave for camp - until T.J. uncovers an evil plot to do away with summer vacation! A crazy former principal, Dr. Benedict, is plan… ning to use a laser beam to alter the weather and create permanent winter. Faced with the dire threat of year-round school, T.J. rounds up the RECESS gang and bands together with some unexpected allies - Miss Finster and Principal Prickly - in a nonstop adventure to save everyone's summer break. As the kids discover the heroes inside themselves, a platoon of wacky characters, far-out music, and sci-fi surprises turn this madcap mission into a major victory for fun!